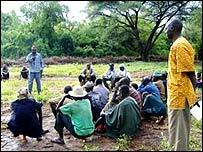 The tribes of the South Omo Valley in Ethiopia recently held a gathering to discuss shared concerns and invited their neighbours from the Kenyan and Sudan borders. It was supposed to be the dry season in South Omo, but it was raining hard. "What else did you expect?" asked one of the participants in the meeting, as water trickled into the tents and the access roads dissolved into lakes of liquid, milk-chocolate coloured mud. Rain is a blessing which the elders have powers to invoke, and there had never been so many elders in one place at the same time. As we slipped and slithered our way towards the venue some 18 hours behind schedule, we plunged into the thick forest which fringes the Omo River, and then came out into a huge clearing, studded with shade trees, and bordered by neatly built straw beehive huts where the participants could sleep. Under the biggest tree were 200 or 300 people, squatting or reclining on mats or, frankly, dozing as they were addressed by the head of the regional government. The audience at that session was more interesting than the speeches. 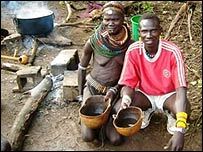 The people of the Omo Valley love personal ornament and every tribal group has its own speciality. There were elders, dignified in turbans and trilbies and bright woolly hats, children stark naked except for strings of beads. There were Turkana women in red blankets and bead collars, young Mursi men with their hair shaved into patterns and a length of blue cloth slung elegantly over their shoulders. 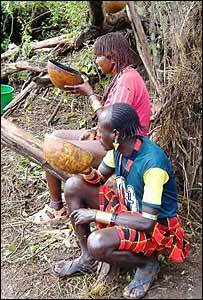 Hair gel has not yet reached South Omo, so the Hamar people build up their elaborate hairstyles using the abundant red-brown mud. There was a lot of jewellery: earrings and bracelets, armlets and anklets and hair ornaments. There were girls in soft leather skirts fringed with jingling metal discs, boys with body paint, women with belts made from used cartridges and men with feathers in their hair. Many had their faces or bodies patterned with decorative scars. Some of the Nyangatom men - the hosts of the meeting - rather ominously had the elaborately scarred chests which meant they had killed at least one man in battle. Killing your enemies in battle, along with cattle raiding, has been the traditional sport of the area. It made your parents proud of you, attracted the girls and enabled you to grab enough cattle to pay for a bride. But what had been just about tolerable in an age of spears and shotguns turned into mass killing when automatic rifles began to arrive from over the border with war-torn Sudan. One of the main motivations of the group of educated young men who first suggested calling this meeting was to get the killing to stop. This feuding and warring is by no means past history. Just three months ago there was a big battle between the Mursi and the Bodi, and around a dozen people were killed. The Mursi were also feuding with the Nyangatom so, when they got the invitation to the meeting, they were suspicious and very wary about going into Nyangatom territory unarmed, which was a condition of attendance. But in the end everyone came and nearly everyone left their guns at home. And although at the start there was some dredging up of old grievances, by the fourth day - when the regional administration joined the discussions - they had come up with a conciliation committee of elders and a plan to reinforce government justice with a system of fines, paid in cattle. With that out of the way, the meeting was able to turn to other things. The tour companies bill this area and its people as one of the last great untouched parts of Africa. Now a daily procession of four-wheel-drive vehicles arrives, carrying tourists and their cameras. They come to take pictures of the wildlife and the people, at the going rate of two birr (10 pence; 20 US cents) a photo, then head back to the nearest cold beers and hot showers. The more thoughtful people on both sides know this is unsatisfactory. One Hamar woman - with the beautiful copper coloured ringlets which makes Hamar girls such a popular photographic subject - told me that what really hurt was the thought of the tourists going home, showing the pictures to their friends and making fun of what they saw as strange, primitive people. That and the fact that there was no way of getting to know each other better, of satisfying their mutual curiosity. Creating a better kind of tourism, which would be more satisfying and also bring in more income, is a real challenge in this area. In one part of northern Ethiopia, farming communities have built guest houses and they are welcoming hill walkers as paying guests as part of a community tourism project. Some people from Omo have already been up to meet them to see whether they could do the same. But Omo is far less developed. A northern Ethiopian farming village is just exotic enough for a foreign tourist to find it exciting without being intimidating. Being hosted by people in full war paint and carrying Kalashnikovs could be downright scary. From Our Own Correspondent was broadcast on Saturday, 24 November, 2007 at 1130 GMT on BBC Radio 4. Please check the programme schedules for World Service transmission times.